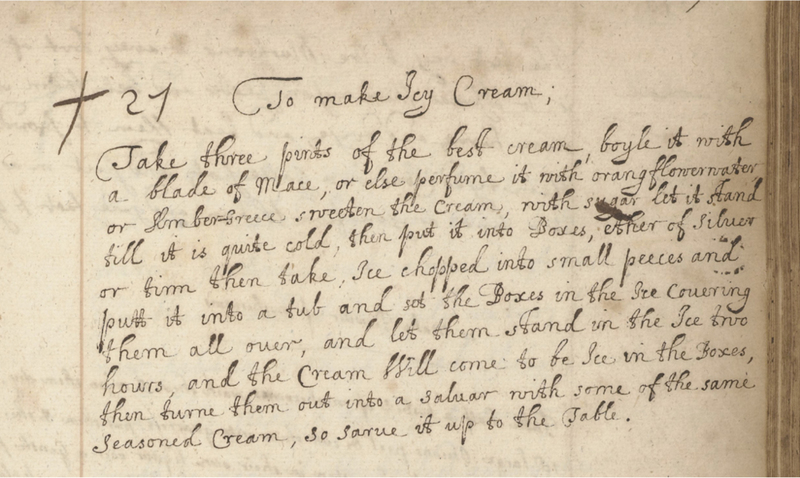 The History Dish: I Made Ambergris Ice Cream! Ice cream made from whale puke. I’ve done it! Below you’ll find a reprint of some information from my original post, but then read on for the results! I needed to known what ambergris ice cream tasted like. Ambergris is very, very expensive: it will run you about $25 per gram. There are more affordable, essential oils made from it, but often they are labeled “not for consumption.” I searched far and wide and finally found Dewberry’s Herbal, an Etsy shop stocked with handmade essential oils that even lets you choose which oil base you want. I picked the “True Ambergris (Sperm Whale)” with grapeseed oil, the most neutral of oils! When I opened the bottle, I would describe the first whiff of scent as “Old Man Body and Breath.” Ambergris is a used in perfumes today not necessarily for its own smell, but because it deepens and intensifies other scents, and makes them last longer. I added 1/2 teaspoon to a quart of homemade custard ice cream base, and let my ice cream maker do its thing. Once frozen, I tasted it: the first thing I noticed was the unbelievable texture. Custard (egg based) ice cream already have a very rich texture, but this ice cream was the smoothest, creamiest ice cream I have ever tasted. I attribute it to the extra 1/2 teaspoon of grapeseed oil. Ice cream texture has a lot to do with fat content, and apparently, adding a little extra oil at the end is a technique worth playing around with. The flavor itself began floral, and finished armpit, with a taste that even now still lingers my tongue. It wasn’t truly repulsive, but after awhile, it did make my stomach start to turn. But I considered that I might be biased; sometimes, I find, that when I’ve prepared a strong-smelling food, I tend not to like the end result because I can still perceive the original foul smell, even if its barely noticeable. This has happened to me once before, while preparing moose face. So I took it to a test group. 3/6 people genuinely appreciated its floral and musky qualities; they ate it with pleasure. 2/6 liked it until I explained what ambergris was. 1 said he could understand if someone handed this flavor to him and said it was the next big thing, but didn’t like it himself. In an era when sweets were packed full of orange flower water and rose water, it makes sense that the complex floral flavors of ambergris would have been appreciated. However, this is what life was like without vanilla, folks. Support you local vanilla farmer. Oh my goodness! This was a great read. However, I’m not so sure the flavor of the ice cream would appeal to me. Mercy! Vanilla ice cream will taste so much better to me! I have made many things with ambergris as it has fascinated me since the first time I read about it. I have make hot chocolate with jasmine, cookies, pie crust,sweet potatoes with rose — well lots of things. The absolute best thing was a port drink. The dusky quality of the old port and the ambergris was heavenly. I would love to see how your oil compares to ambergris in its original state. I do know that many people do not like the smell, others love it and many men can’t smell it at all. It’s great you had a chance to play with it! Mucus-covered squid beaks, my favorite! I don’t ever want to try this, Sarah, but I loved reading about it. Thanks, everyone! And I promise it tasted better than I made it sound. It also seems like you love it or you hate it. Hi, I found your article very interesting, thank you. I am also very puzzled by this child’s face “ramekin”, where did you get them? Wow, thank you very much for posting this! 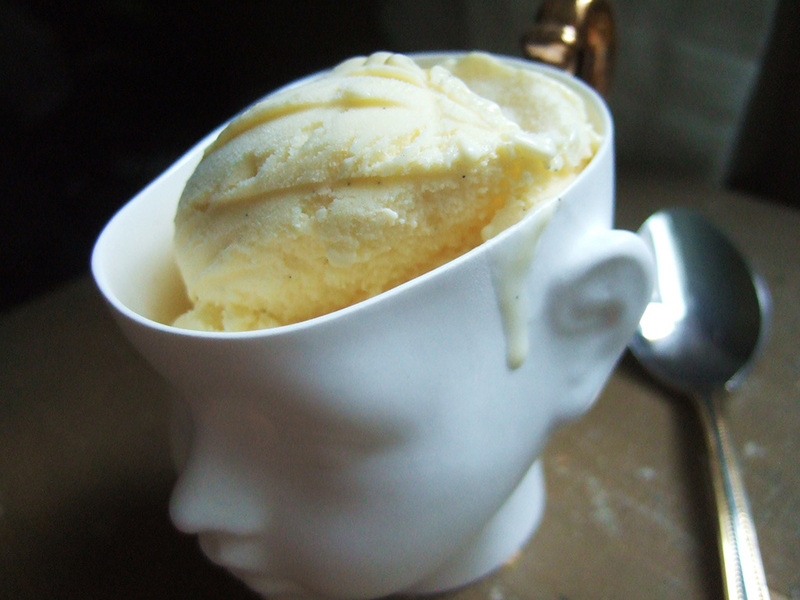 I found the BEST Green Tea Ice Cream Recipe. You should try it, it was a piece of cake(lol)! So delectable! Update! I’ve recently learned whales don’t puke out ambergris. It comes out the other end. This is fascinating stuff. Reading this I was all the way there, imagining a trickle of ambergris in my ice cream…untill you said it ended with a note of armpit”. No thank you. I think maybe the ambergris would have been better mixed with other things, vanilla for example. I think in history ambergris was seldom used on its own; one of its properties that it is prized for is ability to amplify whatever it is mixed with, as well as blending and smoothing out the other ingredients. I’ve never eaten it, but I have used it in perfumes and it really is magical, as are all of the animal-based perfume ingredients.